Roughly 10 years have passed since the great national burger freakout took hold. No one knew when or where it began, nor the identity of burger patient zero, but seemingly overnight our nation fell into a mania not seen since Ray Kroc franchised a fast-food hamburger concept from brothers Richard and Maurice McDonald. It was around 2007 that fancy restaurants with white-linen tablecloths were suddenly adding the lowly burger onto menus en masse, raising its status using expensive cuts of beef from Japan and luxury ingredients like Perigord black truffles. A sesame bun no longer sufficed—it had to be a house-made brioche or pretzel bun—and the word “artisan” by law had to be used. 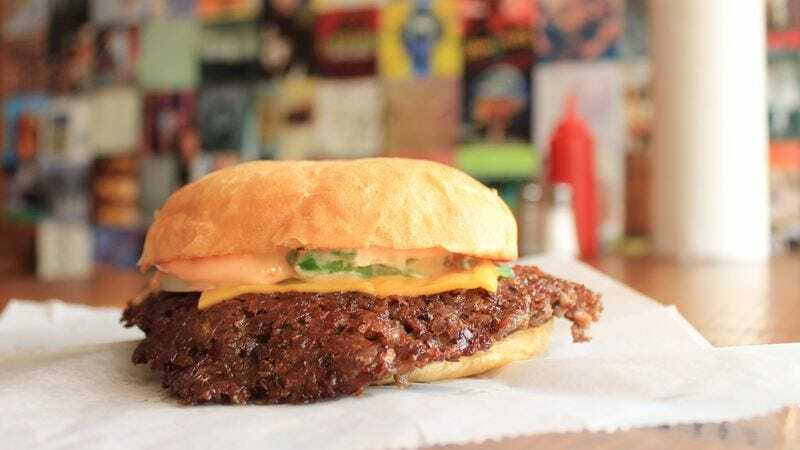 In most cases, the burger of the late-2000s burger revival was of the unhinge-your-jaw-to-consume variety, with patties as wide and thick as hockey pucks, and a medium-rare red center was default. But in recent years, we Americans—as is our wont—discovered a better, hotter, newer thing. Structurally it was the inverse of the two-handed gourmet burger; a smaller, less indulgent, less complicated sandwich. We opted again for just American cheese and simple fixin’s, sometimes bacon and onions if we’re feeling randy. The most identifiable trait of this recent burger trend is the smashed beef patty. Beginning with a ball of ground meat, the cook would press this beef down hard with a weighted implement against a flat-top grill. This effectively flattens the meat and browns the surface to a crisp. Smashed burger enthusiasts will note there exists varying degrees of smash. The burgers found at Shake Shack, Steak ’N Shake, and Smashburger are pressed against a hot grill, and the end result is a thin, crisp-surfaced, diner-style patty. But there’s one level beyond this: By scraping down the sides of the raw patty, the grill cook could produce a wafer-like beef edge. In doing so, a new vocabulary of descriptors previously not associated with hamburger meat avails itself: lacy, chip-like, a crispy lattice of beef crust. Freddy’s Frozen Custard & Steakburgers, Harlem Shake, and the Northwest Indiana-chain Schoop’s are three such purveyors that have taken the beef-smashing concept to the extreme. Who can we thank for this? Like tracing the provenance of who first added marinara to spaghetti, the origin story gets hazy. But we can work backwards. Certainly Serious Eats writer and kitchen wizard J. Kenji López-Alt deserves credit. In 2012, López-Alt penned a post advocating for the smashed burger technique. In it, he argues three reasons why smashing is the superior method: a) increased browning of the meat (via the Maillard reaction) means meatier flavors, b) a smashed burger—especially when the ground beef is placed on the grill cold—retains its juiciness, and c) cooking time is much quicker. When López-Alt published that story, it became one of those rare recipe pieces that “broke the internet.” It seemed every other food-loving friend was sharing the post on social media, then sharing photos of their at-home smashed burger efforts. Eighteen months later, Lopez-Alt would reprise his success with a post taking it one step further—as Freddy’s, Schoop’s, and Harlem Shake do—with what he called the ultra-smashed cheeseburger. Where López-Alt innovated was employing the technique from Shake Shack but with thinner patties to achieve maximum browning and crispness. I lost my smashed burger virginity at age 26, in the nascent days of our national gourmet burger freakout. It happened at the flagship Schoop’s Hamburgers in Munster, Indiana, 45 minutes south of downtown Chicago. What caught me off guard was how the cheeseburger was engineered in a manner I’ve never seen before. The beef extended from the center of the sandwich and draped over the sides like a petticoat, rendering the bottom bun invisible. The patty wasn’t uniformly flat, but thickest at the center, tapering ever thinner until it reached the periphery and beef simply disappeared. I suspect many before me did what I did next: nibble off the crusty beef overhang. If meat could take the form of a cheese crisp, it would be this. It tasted like beef concentrated, with the deep, meaty, savory aroma that permeates finer steakhouses. The burger came dressed with tomatoes, lettuce, and onions, but I removed all until only meat, bread, cheese, and bacon remained. It was—and remains—one of the finer burgers I’ve tasted. Mark Schoop was happy to volunteer information about his restaurant’s storied history, and how they grew to a successful business with 20 locations today. But when time came to inquire about technique, Schoop turned coy. The sought-after modus operandi of the smashed burger was a proprietary secret. But there is a price to loosen lips, and for Mark Schoop, it’s $20,000. That’s how much it costs to franchise a Schoop’s, to which you’ll receive expert hands-on training for at least one month, 70 years of business know-how, and for our purposes most importantly, the proper technique to achieve those Saturn-shaped cheeseburgers. What specifics I tried to pry loose from Mark Schoop emerged as vague generalities, but he did say it begins with owning a flattop grill—which most home cooks won’t. Rund found a restaurant space in the Chicago neighborhood of Roscoe Village, a leafy residential area (overrun by strollers on weekends) a mile west of Wrigley Field. Two months ago, he opened The Region—a tribute to the colloquial name given to the area of Southeast Chicago/Northwest Indiana that birthed Miner-Dunn and Schoop’s. The restaurant’s specialty are burgers, ones where the patty is smashed to within a micro-inch of existence. Rund brought me back to his kitchen and showed off his wares. A standard spatula or steak weight wouldn’t do the job he needed. So Rund special-ordered a bricklayer’s trowel, then hired a welder to shear off the pointed corner to his exacting specifications. It’s heavy-duty equipment more appropriate for construction sites than restaurant kitchens—but boy does it ever smash the hell out of a ball of ground meat. Like Mark Schoop, Rund would divulge only to a certain point. He revealed there’s no oil added to the grill needed to sear the meat (the beef will render out enough fat), and he found the ideal cooking temperature to be 325 degrees Fahrenheit. But proper hand placements for burger smashing? A tutorial on technique? It wasn’t going to happen. And so I was relegated to wait outside the kitchen, where I heard seductive clangs from the grill top. The burger arrived within minutes, and the meat, seared to a sheen, spilled over the sides. I peeled off the crumbly, crisp-verging-on-crunchy surplus beef, and ate it like a potato chip. The epiphany came: We endured the truffled-artisan aioli-Wagyufication of our burgers long enough, and coming to our senses now, we’ve realized the true way was the straightforward way, the one that only requires beef, salt, elbow grease, and nothing more.